A service has been held to mark 40 years since three children and two aircrew died when an RAF plane crashed into a housing estate. 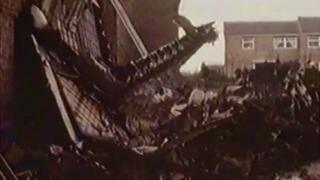 The Canberra was on its way back to RAF Wyton in Cambridgeshire when it plunged into houses in Oxmoor, Huntingdon, at about 11:00 BST on 3 May 1977. A memorial bench featuring five doves - one for each of the dead - was unveiled earlier, as the Hunts Post reported. It is thought the plane crashed when the pilot lost control. The Canberra was returning to its base after a routine photo-reconnaissance mission when it crashed into the row of terraced houses on Norfolk Road. Sisters Kelly Middleton, aged two-and-a-half years, Tracey Middleton, aged four-and-a-half, and baby Adrian Thompson, who was just three-and-a-half months old, all died. The pilot, Flt Lt John Armitage, 27, and navigator Flt Lt Lawrence Davies, 26, were also killed. Eyewitnesses at the time described a "blinding flash of light" as the plane hit the houses and exploded. Speaking in the Commons the day after the crash, then-Secretary of State for Defence Frederick Mulley, told ministers: "I am sure that the House will wish to join me in expressing great sympathy to the parents and relatives of the little children and of the crew who died and to those who were injured." He said the crew did not use their ejector seats and the weather at the time was good. The 40th anniversary service at Sapley Playing Field at 12:00 BST was organised by Huntingdon Town Council to remember those who lost their lives and to pay respect to their families. Two of those attending were baby Adrian Thompson's mother Brenda and his sister Nicola. Mrs Thompson recalled how "there was this explosion and flames and fire". "We were trying to get out the back of the house," she said. "I got Nicola out, but Adrian was asleep upstairs and I couldn't get upstairs to get him." The service was followed by the unveiling of the bench and five plaques. The council is collating people's memories of the incident, to be published in a book at a later date.